VocalEssence Vintage Voices fosters the creation of choirs in assisted living communities and senior centers. 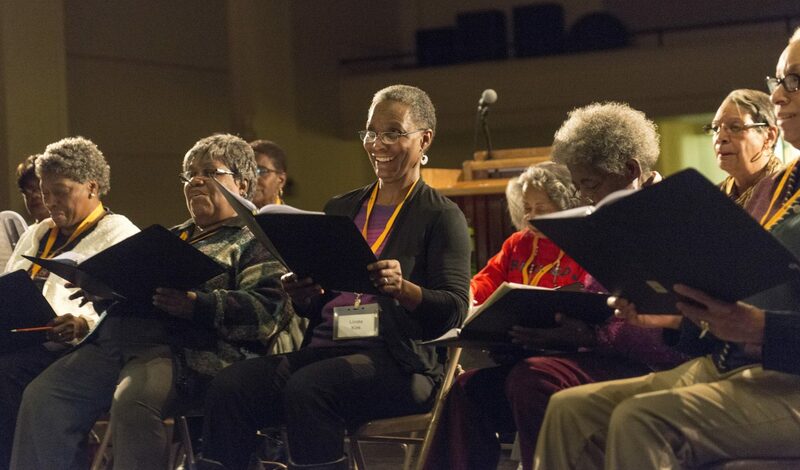 VocalEssence Vintage Voices is an exciting new choral program that integrates the arts into the everyday lives of older adults by fostering the creation of choirs in assisted living communities and senior centers. Activities include choral rehearsals with conductor Rob Graham and accompanist John Jensen for 12 weeks, culminating in an on-site concert for friends, family, residents and community members. Weekly rehearsals focus on the process of singing together, and incorporate sensory-rich activities, social and reflection time. This interactive, ongoing approach aims to elicit proven health benefits of creative arts, including improved health outcomes, reduced depression, increased engagement and pleasure, and improved self-esteem. In terms of singer recruitment, no audition is necessary to participate, but partner sites need to demonstrate interest and commitment from at least a group of 20 who will consistently attend rehearsals as well as a VocalEssence concert. To participate in VocalEssence Vintage Voices, contact VocalEssence at info@vocalessence.org or 612-547-1451. This activity is made possible by the voters of Minnesota through a Minnesota State Arts Board Operating Support grant., thanks to a legislative appropriation from the arts and cultural heritage fund, and a grant from the Wells Fargo Foundation Minnesota.